Cade grew up around Plumtree N.C. where he spent most of his time fishing the North Toe river and surrounding small streams. Cade has been guiding for over 15 years for clients young and old. 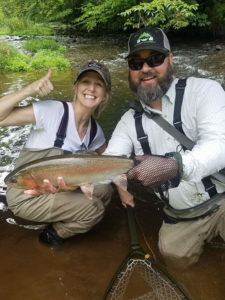 He fell in love with fly fishing because of the challenge, and being outdoors. Cade enjoys guiding clients of all ages. 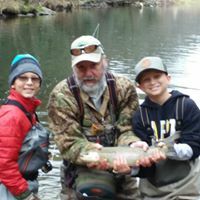 He loves guiding kids, and has 2 of his own that enjoy fly-fishing. While chasing big native Brown Trout is what he enjoys most, Cade also likes to float for Smallmouth Bass, Carp and Musky in NC, TN and VA. If your looking for a laid back guide with a passion for helping others catch fish then you need to give him a call. Bob started fishing as a boy on the Eastern Shore of Maryland and soon discovered chasing Rockfish (striped bass) and Blues with a fly rod. Later he traveled to the mountains of Maryland and West Virginia and fell in love with trout in those mountain creeks and streams. He now lives in Western North Carolina, where he spends his time fishing and guiding clients on hundreds of miles of rivers and streams. Bob also enjoys fishing and guiding Tenkara, an ultralight and very simple style of Japaneses fly fishing. Whether you are an old pro or you would like to learn fly fishing, a trip with Bob will be a memorable experience. Steve was born and raised here in Western N.C.. He has had a love for the outdoors and the Blue Ridge Mountains his whole life. 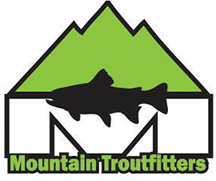 Steve has been a avid fly fisherman for 35+ years and loves teaching others the sport. 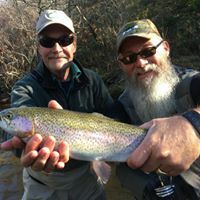 The South Holston and Watauga rivers in Eastern TN is where he has spent a lot of his time. Fishing for native Brown Trout on 7X tippet and small dry flies is something he just cant get enough of. Steve has the knowledge and patients to help you improve your fly fishing game , give him a call. Growing up here in the mountains of Western N.C., Jeff has spent his whole life in the outdoors. It would be hard to find someone who enjoys fishing as much as he does. 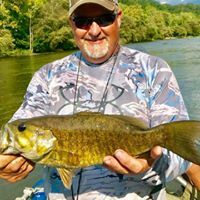 Jeff enjoys catching fish of any kind but his passion is catching big Smallmouth Bass. He also is a skilled taxidermist of 30+ years. That is where he gets his artistic skills that you can see in the flies that he ties. If you like the thoughts of catching some nice fish and spending some time with a laid back fish junkie then Jeff is the man. Brandon moved down to the mountains of Western North Carolina back in 2001. He fell in love with the Appalachian mountains right away. In 2008 he thru hiked the 2,175 mile Appalachian trail from Maine to Georgia. 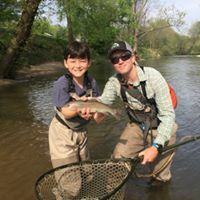 With his passion for being in the woods you can either find him chasing brookies on small mountain streams, or floating the surrounding tailraces. No matter your skill level or age, a day on the water with Brandon will be one that you will not soon forget!